Bogachan Sahin, M.D., Ph.D., became Chief of Neurology at Highland in April. He succeeds Adam Kelly, M.D., who served as Highland Hospital’s Chief of Neurology for almost six years. 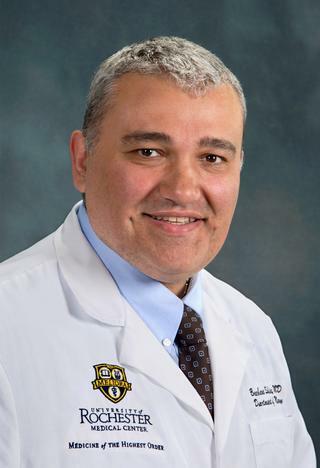 Dr. Sahin has been an Assistant Professor of Neurology at the University of Rochester’s School of Medicine and Dentistry since 2013 and became the Director of the Vascular Neurology Fellowship Program at the University of Rochester Medical Center in 2015. A native of Turkey, Dr. Sahin earned his bachelor’s degree in molecular biology at Princeton University and his M.D. and Ph.D. in Neuroscience at the University of Texas Southwestern Medical Center. He went on to complete his residency in Neurology and fellowship in Vascular Neurology at Johns Hopkins University. The following is an interview with Dr. Sahin about his new role and Neurology at Highland. What are the current goals of the Department of Neurology at Highland? For the next 12 months, our singular focus will be to achieve Joint Commission certification as a Primary Stroke Center. A lot of the pieces are already in place for us to earn this designation. Highland is already certified as a stroke center by New York State, but the state will soon end its certification program, so we need to become Joint Commission certified. Our program meets or exceeds all the certification requirements. It’s a matter of keeping our delivery time for clot-busting therapy under 60 minutes and completing the application process. What are your first impressions of Highland? I feel at home at Highland already. I did some of my residency at Bayview Hospital, a Johns Hopkins affiliate, and the size, culture, patient demographics, and close-knit environment were very similar to Highland. We care for the whole spectrum of neurologic disease here, but 60-70 percent of our neurology consults are stroke patients, so it is essential that we do stroke well. The stroke team at Highland is second to none. We have a wonderful, multidisciplinary group of smart, dedicated, hardworking, and talented individuals who want Highland to excel in this sphere. I’m so fortunate to step into this new role and have all this in place. Why did you choose the University of Rochester for your career? The University of Rochester has one of the top 10 neurology departments in the country in terms of National Institutes of Health funding. It is a national leader in medical and graduate medical education. While I was looking at different programs, I also heard a lot of great things about Rochester from some of my mentors at Hopkins, who had trained or worked here and still had personal connections to the department. Without exception, they all told me Rochester was a wonderful place to work, live, and raise a family. After meeting with the leadership and the stroke team, I knew this was where I wanted to build my career. Fortunately my wife was equally excited about making Rochester our home. We’re grateful to be raising our son and daughter here. You have been very successful leading the Vascular Fellowship Program and keeping the program filled. In 2017, there were 76 Vascular Neurology Fellowship Programs across the United States and only 36 of them were filled. What is your secret? Participating in the fellowship match has definitely been a boon for our program. It also helps that our neurology residency program is nationally and internationally recognized as a leader in education, and our department has a formidable footprint in the American Academy of Neurology. In terms of stroke training, we offer large patient volumes, broad faculty expertise, strong residents, and a treasure trove of educational opportunities for prospective stroke fellows. More important, we give our fellows the freedom to shape their training according to their individual goals and needs. Whether your interest is clinical trials, bench research, quality improvement, stroke prevention, neurorehabilitation, palliative care, ultrasonography, interventional neurology, or neurohospitalist medicine, you will find a home in our program. My job is to train excellent fellows who will spread the word and to make sure applicants know all that about our program before they decide where to train.